At present, non-payment of the £60 civil penalty in England leads to it being doubled to £120 after 21 days and subject to prosecution after 28, but 40 per cent still fail to pay and many do not end up in court because councils do not press legal action. Mr Cameron said tougher action would ‘tackle the harm truancy does to a child’s chances in life’, citing statistics which show that fewer than 17% of children with 28 days’ absence at key stage four achieve the English baccalaureate, compared with 44 per cent of those who missed no lessons. 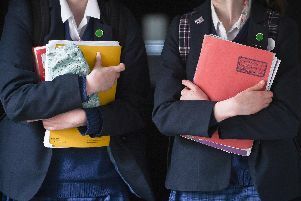 It comes after a warning from education leaders across the Portsmouth area last month for parents to send their children to school or face the consequences. Statistics released by Portsmouth City Council show figures for absent pupils are still above the national average, with 6.4 per cent of children off secondary school over the academic year, compared with 5.2 per cent nationally, in 2013/14. In Gosport, 6.1 per cent of children were absent from secondary school in 2013/14 and 5.5 per cent were absent in Havant. Meanwhile, in Fareham the figure was below the national average, at 4.9 per cent. The child benefit plans, unveiled at the Conservative Party conference in Manchester, are expected to ‘significantly’ reduce the legal costs of councils by removing the need to take non-payers in receipt of child benefit to court. Schools will not be obliged to provide holiday care or ‘wraparound’ clubs when asked, but will be required to publish reasons why they do not respond to requests from groups of parents or childcare providers. The right to request will apply to all state-maintained primary schools, as well as new academies and free schools, but head teachers will not have to consider requests to use their sites during school hours or at times when they already operate clubs. ‘Ensuring children get the best start in life is at the heart of our plans,’ he said.